Do Italians Eat Pasta Every Day? One question I get from many people is whether Italians eat pasta every day. Of course answering such a question would require an enormous generalization, so I’m going to give you the experience in my house, which consists of a Calabrian and an American with Italian, Lithuanian, and German blood. Do we eat pasta every day? Pretty much, yes. Usually either lunch or dinner — but hardly ever both — contains some kind of pasta for us. I’m sure for some of you the thought of eating pasta every day sounds boring, and you’re positive you’d get sick of it within a week or so. This actually did cross my mind as I considered moving here — would I just get sick of eating pasta? And if so, then what would I do? Well, seven years in, and I’m still having some pasta on most days. Don’t get me wrong; there are days when I just don’t want pasta. So I don’t eat it, easy peasy. One important thing to remember is that Italians don’t eat pasta with “red sauce” and meatballs every day; in fact, the rumors you’ve heard about Italians not eating “spaghetti and meatballs” are true; if there are meatballs, they are often huge and served after the pasta course, so you’ll have one, *maybe* two at the most. That “red sauce” is often a ragù, made with meat (often pork and for us, rabbit or chicken); in our house, that’s probably a once every two weeks kind of dish, often on a weekend. Also? Italians don’t just eat spaghetti. As I’m sure you know, pasta comes in all shapes and sizes, and part of the fun is matching what kind of sauce or accompaniment best suits a certain kind of pasta, so there’s a lot more than spaghetti going on around here. So what else are we eating with pasta? Well I have a list of recipes to give you some ideas, and you’ll see everything from tuna (with or without tomatoes) to broccoli (no tomatoes) to ricotta fresca to fresh tomatoes and basil to prawns. We eat pasta cold in a salad in the summer and hot in minestrone in the winter — and with legumes like peas, ceci, and lentils year round. Pasta is very versatile, and as always, I do encourage you to experiment. But Pasta Makes You Fat! Another misconception regarding pasta is that some people believe that if they ate pasta every day, they’d be the size of a house. The answer to that is, well, it depends on how much pasta you eat and what you’re eating with it. Pasta and carbohydrates have gotten a bad rap in health circles, but you *do* need them in your diet — in moderation, just like everything else that helps your body function the way it should. Italians seem to know instinctively that 100-200 grams of pasta a day falls well within the recommended daily allowances of carbs. You just have to not load up on carbs the rest of the day in order to keep a good balance. Other health issues like diabetes may cause concern with carbs, but if you’re an otherwise healthy person, eating a bit of pasta a day is one of the common features of the Mediterranean Diet, which we know can offer great health benefits — but know that is not a “diet” as the word has come to be understood. It is a way of life. If you still can’t imagine eating pasta every day, think of it this way: do you eat bread every day? Many people do, in one form or another. Well you can think of pasta as our bread. It accompanies other ingredients and isn’t really the “point” of the meal — although it’s still an important part to be sure (see the discussion of matching pasta with sauce above). Note also that Italians will generally *not* eat bread and pasta together, so don’t be surprised if you’re in an Italian restaurant and they swipe any bread off the table just as the pasta is served. But hey, we’re not all created the same, so it very well may be that you would get bored with an Italian diet and with eating pasta every day. So why not come over here and find out? I do eat pasta about 4 times a week. I can’t help it, it’s so good. I have learned in the last few months that pasta isn’t always spaghetti and meatballs or cold pasta salad. I love all the various ways to cook and serve pasta. I love how you compared pasta to bread. How true! Thanks for the links in the post as well as the content. Good reading and eating. I use to eat at least once a week… Me and my boyfriend love pasta pretty much! Mmmm Italians all over the world love pasta…hahaha! I’ve eaten pasta almost every day in the 9 months that I’ve been here, and I’ve lost weight. 🙂 Recently I’m eating it less just because it’s suddenly so hot here that all I want is tomatoes and mozzarella and anything that doesn’t involve heating up the kitchen. But otherwise, pasta makes it into my diet every day. My favorite quote is the famous one by Sophia Loren, “Everything you see I owe to spaghetti”. Since living here the Mediterranean diet has definitely improved the health and weight of both my husband and myself. We do only eat pasta two/three times a week though and never( or extremely) rarely in the evenings, hen we tend to avoid carbohydrate if we can. We do not eat bread every day either. We certainly are both feeling fitter since moving here! My neighbors, Italiani DOC, eat it alsmost everyday. On the days when they occasionally have risotto instead, the husband walks around moaning that he’s been mistreated. Pasta every day, of course. After living here for a while, it doesn’t sound strange, but I was pretty much shocked when I first thought about it. There are so many varieties and different types of dishes you can make with pasta that you just can’t get bored with it. Of course, we do have rice once in a while instead…. We have risotto probably once a month…and *never* polenta, which is funny because I actually had polenta in the States quite a bit when my grandmother was doing the cooking; even though her roots were in southern Italy, we had a sizable group from northern Italy in the area so we ended up eating things like polenta and luganega (a northern Italian salami) too. P has never even tried polenta! Very well explained, Michelle. I like the analogy that you used with bread. Nice article! As an Italian abroad, I’ve got the same question many times. Here in Ireland, there’s a bit more variety in pasta sauces (not just meatballs! ), but still nothing approaching Italy. I wanted to note for your readers that in the north of Italy rice is sometimes eaten instead of pasta. I grew up in Milan and we had rice 2-4 times a week, depending. Mostly risotto, of which there is also a great variety, not just the classic saffron type. The same would apply in most regions of the North, though the proportion of days when you eat pasta or rice would vary from family to family. Also, in my experience my ‘italian family’ who eat very traditionally will often have bread, pasta and potatoes all in the same meal (different courses) and think I! am strange for not eating all three at once. Infact, my MIL asked me once why i didn’t eat bread. I said of course i do and she said well, i’ve never seen you eat it al all! She was shocked when i said i have sandwiches for lunch (not a ‘proper’ meal in her opinion). I eat a lot more pasta here (5 times a week if not everyday) than I did in the States. However, despite eating more carbs I’ve lost weight without trying. I could never get sick of pasta. There are so many ways to cook it. It’s amazing how many people come to Italy and lose weight, isn’t it? For me a lot of that was just getting away from processed foods for the most part…. Wonderful post, Michelle. Reminded me of Gus, my gruff old maternal grandfather, for whom a day without pasta was — well — a totally wasted day. You are bang on about the Med Diet. A bit of carbs in the form of bread or pasta is paired with more vegetables and fruit than most North American diets. Definitely; the olive oil instead of butter or even worse fats also makes a *huge* difference! I still do pasta in the summer, but our kitchen is actually pretty well ventilated; our last one wasn’t. That sucked. Haha P is the big bread eater here; if it were up to me, I’d buy it once a week, but we go through it FAST b/c of him! I eat a lot of pasta. I change it up and eat whole wheat pasta or the tri-color. Sometimes it’s cooked and sometimes it’s cold. I vary it enough that I am not tired of it and in fact, now that I am thinking about it, I want some! For some people, eating pasta may mean going outside your comfort zone of red sauce and meatballs, but it is so worth it! You’ll find so many new ways to enjoy pasta! I could absolutely eat pasta every day. My grandfather, who was born in Naples, insisted on eating some sort of pasta dish daily. And, as you said, we eat it more often without red sauce or “gravy.” Pasta with zucchini, pasta with broccoli rabe, pasta and peas, pasta and lentils, pasta with beans and greens. It’s endless. My family never gets tired of it. I want some now! Haha all this talk of pasta does make one hungry for it, doesn’t it?! It really depends–sometimes I’ll make a mess of it to take to work and it will last 3-4 days, and usually it’s a very simple pasta, either sauceless or only very lightly sauced (as that tends to hold up in the fridge), and there are days when I come home and am on my own for dinner and aglio e olio is my hands-down favorite because it’s fast, easy, and can be modified. We’ve been making a lot of fresh pasta on the weekends lately, often because we keep encountering lovely ingredients to turn into pesto, such as ramps and garlicscapes. I eat past once a day, every day and this is what most people in Puglia do. It is true that if we eat pasta, we would not eat bread (or other carbs). I run a Mediterranean cooking school in Puglia with my sister (a Cardiologist) and we always say to our students how healthy it is to eat GOOD carbs at every meal. Our body needs carbs, but we need to eat the good ones: pasta (or bread) should be made of durum/hard wheat, barley or rye. Also pasta should be eaten in moderation (80 grams of pasta for women and 100 grams for men, per meal) and paired with vegetables, or olive oil and home-made tomato sauce. Thanks so much for sharing your Puglian experiences, Cinzia! In my Italian-American home we ate (and still do eat) pasta several times a week paired with either a homemade tomato sauce or vegetables. Meatballs or other meats are always the “secundi piatti,” e.g., eaten after the pasta. My dad’s homemade bread (or other good bread) is used only to scoop up an extra tomato sauce that remains on the plate. I am always a member of the “clean plate club” when pasta is served! And for an Asian like me, I eat rice almost everyday…that is, when I’m not eating pasta!! As I was writing this, I was actually thinking about Asian cuisine too, and how surely there are people who wonder how Asians can eat rice everyday…hello, because it’s not the rice that makes the meal! Thanks for stopping by, Jen! lovely topic:-) i am a real risotto-fan, so we have around once a week risotto at home, my stomach does not really support pasta…its funny to be Italy-fan but do not eat pasta…have a great rest of the week! Noi mangiamo la pasta due volte la settimana – Giovedi’ e Domenica. Saluti! hm, i think this is an easier concept for those of us born into Italian families!! Love that comment by Sophia Loren! She was really packed nicely with pasta and still is. do it soon, I promise. At home about two or three times a week. When we are vacationing in Italy nearly everyday. Macaroni, wine, dolci and gelato daily for two or three weeks and I loose weight. All due to the portion size(s) lack of junky snacks and all of the walking. Loved this writeup!!! I eat pasta every day w la pasta!!! Haha, thanks for sharing your habits, Enrico! It’s time for P to eat polenta next autumn. Really, it is so good and good for you! Polenta is a whole grain, not so refined. Make a nice spicy braise for it. Plus it’s like a vacuum cleaner for cholesterol. That will count one day. You are making me wonder if you are not a victim of the generalization. Does your husband feel he needs it everyday and is that the reason? Don’t mean to sound rude, I’m just wondering why. We don’t eat it everyday; we very our starch intake just for variety, pasta, rice, potatoes, polenta, etc. and often none. This seems pretty much the norm in my wife’s Italian family. And I wonder how one sops up the left over sauce with no bread on the table. I will admit that we tend to eat more American style, that is all the food goes on the table at the same time. That is mostly a choice of convenience and minimizing dirty dishes. My mother in law on the other hand has a bigger dishwasher. John, what exactly do you mean by a “victim of the generalization” when this is actually, truly my life (and the lives of many judging from comments here and the people I know in Calabria). Remember, you’re in the North — if one thing has been established about the so-called Italian lifestyle, it’s that life in the North and South is *very* different, especially regarding food. The Mediterranean Diet really doesn’t extend to the North with all the butter and cream and lesser availability of certain local, fresh produce year round; we (your family and mine) just have different styles of eating — and ours happens to be how both Paolo and I grew up (he more so than I), so I think it’s normal to keep those patterns as you get older. And why would we change them? It’s the healthiest diet around! So is that a victim of generalization, or, you know, centuries-old tradition? Hmm…. But more basic than that, why do we have pasta every day or nearly every day? Because we like it! Why do some people (including me) drink coffee or tea every day? Because we like it. Why do you have bread with your pasta? Because you like it. I don’t. Paolo doesn’t. We don’t all share the same tastebuds, so there are bound to be differences in eating styles too. Michelle, in my house growing up with Sicilian parents we had pasta everyday, meat of some kind, salad simple redwine and olive oil, and fruit! Most importantly there had to be bread everyday! Our pasta wasn’t soaked in sauce either and I used the bread to sop up the salad dressing after I ate my salad (mouth watering right now). No butter on the table we never had it with bread and when I went to my friend’s houses they would eat their bread with butter and thought it odd we didn’t. Also, there was cheese too on the table, Fruiliano or Assiago. Sometimes provalone or swiss. Great post. We eat pasta at least 4x per week. Meatsauce is usually reserved for Sundays. It’s so interesting to hear how many of Italian heritage who live outside of Italy eat pasta so often! My family is from Naples and Sicily and we did the same thing. I think it was called “a scapetta” or something like that! Mary DPT, We also used the term “Gravy” for sauce. Cristina over at Expats in Italy told me that was a term used by Italians in the Eastern US states. Nice hearing it again! Yes, we had gravy too, and my family in the States used bread to scoop up sauce…to be honest, I think that’s more Italian-American than Italian, but maybe it’s more common around Naples…definitely not the norm down here in all the meals I’ve eaten out and about! To answer your question Michelle, I eat pasta almost everyday. My boyfriend’s family eats pasta every day as well. His sister eats smaller portions as she thinks she is more susceptible to gaining weight. (I think she’s actually thin) So like you said, all should be in moderation – whether you eat it every other day, every day, or just eat smaller portions if you eat it every day. In any case, buon appetito! I could bath in pasta every day, I love it so much! I think a lot of people are afraid of putting on too much weight with pasta but I think everything in moderation is fine. Pasta is one of those things that could never get boring with all the shapes and sauces and endless possibilities! I eat it pretty much every day, too…a lifelong habit from having an Italian nonna, but also because it’s so easy, varied, and delicious. I don’t eat much bread anymore, though I used to sit and eat half a loaf of it in a sitting! Even though I knew the answers, I really enjoyed reading your post. In fact, I’ve added it to my Top 10 this week over on http://www.italytutto.com. I would love to eat pasta every single day! Wait…we usually do too and we aren’t even Italian! LOL 🙂 We love pasta of all kind – but our favorite find has been Kamut Wheat pasta…OMGosh is it gooood. Great post! Thanks! And thanks for giving people an idea about a new pasta they can try! It has taken Ed some getting used to since he thinks a meal without meat isn’t a meal, but since I’m the one who cooks, he just has to deal. As for all the people who poo-poo the carbs or think they’ll get fat eating it – they’re just missing out. And what they don’t eat means more for me. I happen to be on the full figured/chubby/fat side but it’s not because of pasta – it’s all the other stuff I eat. But even when I’m “dieting” I never eliminate pasta – I just count it in my calories or points or whatever the hell diet I happen to be doing at the time. Not having spaghetti on Sunday would have been sacriligeous to my Grandma who was Calabrese. My step-grandfather who was also Calabrese, ate hot peppers eggs and every morning and pasta every day. I eat pasta at least once a week. Pasta is Nature’s valium, and you can quote me on that. And I did quote you — on Twitter 🙂 Thanks so much for your comment! That was an absolutely awesome post that I really appreciated! I love pasta but here in Canada, it seems everyone things pasta is spaghetti. It’s not the same thing! 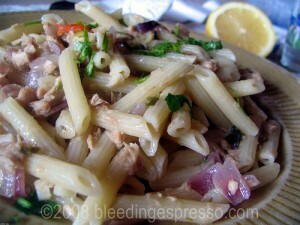 I’d love to try more pasta dishes. I love different pasta salads. Glad you enjoyed, Callista…there are so many fun ways to make pasta. You’ll have to introduce your fellow Canucks to some! OK, Michelle. I was thinking that I probably didn’t want to eat as much pasta as I’ve been serving since I have been “trying to eat like a vegetarian.” You’ve inspired me, and given me affirmation that “it’s OK.” Now, I’ve got to go see what recipes you have listed, and if a doofus like me can cook them! Shelly, most of my recipes are easy, I promise…most are Calabrian, and Calabrian cuisine is known for its simplicity. That, of course, means that you must work with the best ingredients possible b/c not a lot of different ones ever go into a dish…the better quality the ingredients, the better the final product. Enjoy! Your diet (southern Italian) and ours (South Croatia) are quite similar, maybe because only the Adriatic Sea separates us? we eat pasta about 3 x/week. Other days we eat fresh fish, More during the summer and ots of fresh veggies. And you are right, we hardly ‘drown’ our pasta with sauce. 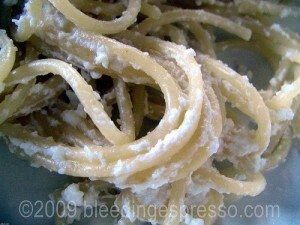 I cook frequently with cooking cream and add fresh basil, it sticks quite well to the pasta. so not much need for bread. In fact, I’m not much a of bread person, growing up in Mexico, our daily bread was corn tortillas, moving here I don’t find the corn flour to make my own tortillas so I just go without them, I still can’t get used to eating bread Every single day!! My kids are swimmers so they eat a lot of pasta. I fall back on macaroni and cheese many times, but I also try to make a cold pasta salad which is good to take along to swim meets. 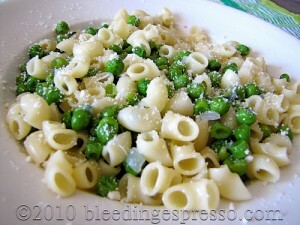 My favorite pasta dish is a bow tie pasta with goat cheese, peas and chunks of ham. By the way, take a look at my food blog if you like… It’s just a little place where I like posting my favorite recipes every now and then, but maybe you’ll find something yummy to experiment! I don’t think I would ever get tired of pasta either. I am very behind in commenting but had to comment on this post. I had to laugh when I first read this post because in Hawaii many people eat rice every day, sometimes three times a day! When I first moved here, I was eating a lot of rice. My mom was worried that my stomach was going to turn into a rice ball (and I was no where up to the daily rice intake). After the initial fun of rice (since I rarely ate it and let me tell you Uncle Ben’s rice is nothing like the rice we eat in Hawaii), I missed pasta. Good on you for following your pasta instincts! That’s one thing I tell people all the time when they’re coming here — do what you want! You may only be here once in your lifetime, so don’t be overconcerned with what’s “right.” I mean, there’s a line between being carefree and being disrespectful, but I think most adults can find that. Maybe? 😉 Anyway same thing bugs me about the cappuccino after 10 a.m. “rule.” Please. Drink it when you want! When I’m in Italy I pretty much want to eat pasta every day! I live in Macerata, Italy… we eat pasta every single day. usually for lunch though, dinner is light, salad, bread and meat. i lost weight eating the italian way. I LOVE PASTA !!!! I eat it almost every day at lunch with all kinds of ingredients and I am skinny ! It’s all about moderation like everything else 🙂 . I have a questions though, do italians eat pasta with bread , like in the same time ?!?!?!?! I envy you for living there ! lol 🙂 Hope someday I move back to Europe.